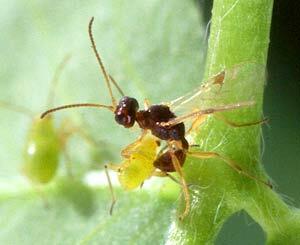 Several tiny wasps are parasites of garden pests. Most common are the Ichneumon wasps, Braconid wasps (pictured at left), and Chalcid wasps. You're much more likely to see the work of these tiny parasitic wasps than the insects themselves: a tomato hornworm festooned with white rice-like cocoons, or a black or golden aphid mummy with a tiny hole in it. Don't flinch at the mention of wasps. These are not the aggressive yellow jackets or ominous looking black paper wasps. Few species of parasitic wasps sting, and then only when they're picked up and mishandled. They're so tiny you're unlikely to be aware of their presence. Several species of Ichneumon wasps parasitize garden pests such as cutworms, corn earworm, white grubs, and various caterpillars. The largest of the parasitic wasps, the adults range in size from 1/8 to 1-1/2 inches, sporting long antennae, legs, and long, slender bodies. Females have long tail-like egg-laying tubes. Colors range from black to yellowish. Braconid wasps are tiny, ranging in length from 1/16 to 5/16 inch, with stout bodies. Host pests include various species of aphids, garden webworm, tomato hornworm, armyworms, strawberry leaf roller, and tent caterpillar, among others. Most are dark with some colored markings, but they are so tiny it's hard to see these colors without magnification. Chalcid wasps range from 1/64 to 5/16 inch in length. They do not fold their wings when at rest like other wasps. This group includes the well-known Trichogramma wasp>. These are available commercially for pest control purposes because they are effective parasites of pest caterpillars including cabbage worm, tomato hornworm, corn earworm, codling moth, cutworm, armyworm, webworm, cabbage looper, and corn borer. Other Chalcid species parasitize aphids, strawberry leaf roller, and other hairy caterpillars. To encourage the help of these beneficial insects in your garden, supply them with food and moisture. Adult wasps feed on nectar and pollen. Small and shallow-faced flowers provide easy access to these tiny beneficial insects. Plant alyssum, herbs from the dill family, and flowers from the daisy family. If you have a bird bath or pool in your garden, place stones in the water so wasps have a place to land and drink safely.